as the one seen here. Photo by David Ingram, MSU Cooperative Extension Service. Phytophthora root rot (Phytophthora cinnamomi) may occur at poorly drained sites or in low areas of fields. Excessive defoliation occurs because of severely damaged roots. Restricted root system that allows plants to be easily rocked back and forth, or pulled up. Dead or prematurely defoliating bushes. Defoliation and poor growth follow the contours of the low areas where excessive moisture is present. Zoospores (swimming spores) produced by the fungus infect blueberry roots. Defoliation and poor growth follow the contours of the low areas where excessive soil moisture is present. Abundant soil moisture and temperatures between 68 F and 90 F (20 C to 32 C) promote disease development. Planting on raised single-bedded rows. Using "sock pipe" and other types of pipe normally used for residential septic fields for draining small areas. Incorporating peat or bark mulch and, then, planting shallow and using additional mulch to form beds if planting on wet clay or clay loam soils. Benson, D.M. and R.K. Jones. Phytophthora Root Rot and its Control on Established Woody Ornamentals. 2000. Retrieved 19 October 2011. Cline, W.O. "Bill," and Annemiek Schilder. 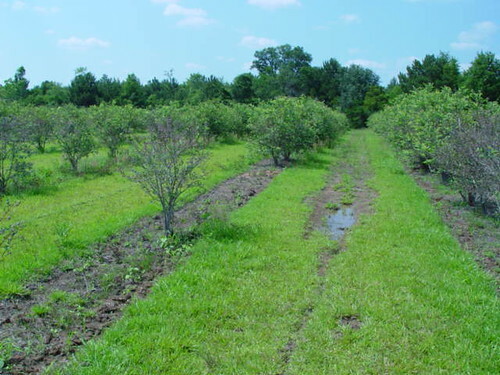 Michigan Blueberry Facts: Phytophthora root rot. 2009. Retrieved 26 April 2010.